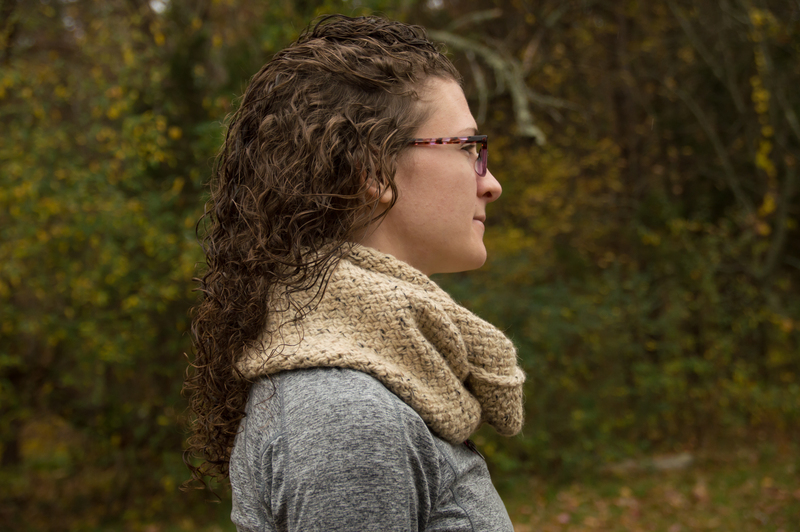 Over the weekend I photographed two of my knitted cowls. My sister-in-law was visiting, and she’s the perfect model, so I ambushed her on her way to the park with my daughters. 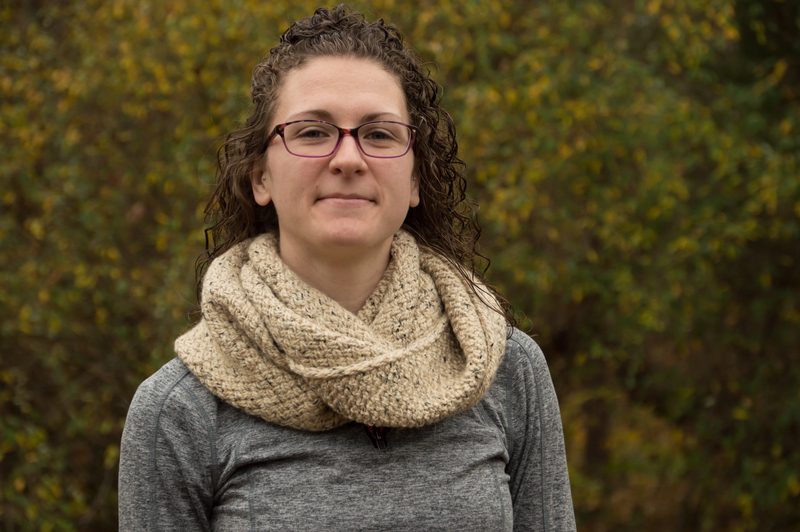 Word of warning – if you’re related to me, I’ll force you to pose for pictures while wearing my handknit items. 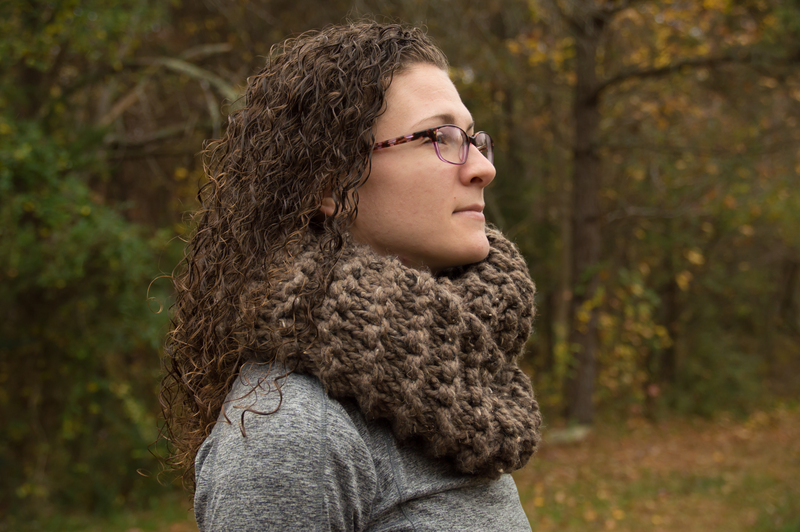 Okay, so I started this Snowdrift Infinity Cowl last winter with the intention of wearing it that season. Obviously it didn’t work out, but it’s finished now and ready for this season! I used Knit Picks City Tweed Heavy Worsted in “Showshoe.” I love the stitch pattern. It’s not something you see very often. The yarn is a tad itchy around my neck, but I’m hoping I get used to it. Either that or I’ll have to wear it over a turtleneck. 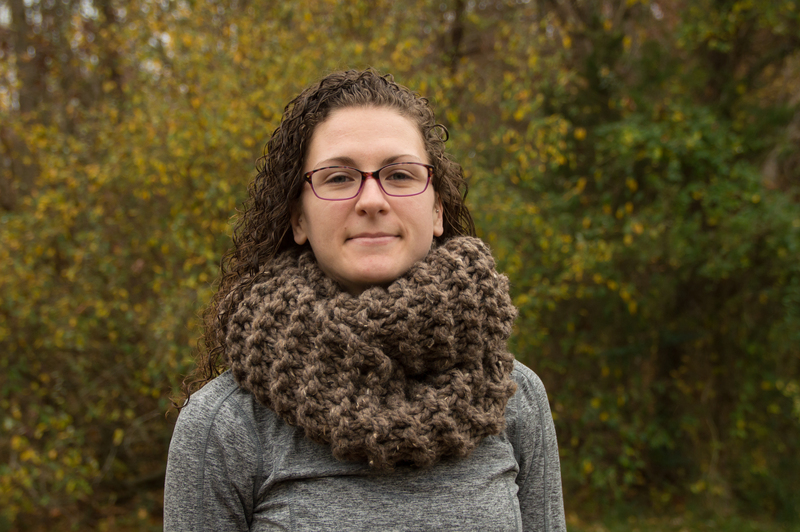 The next cowl I knit for a friend for Christmas. She’s a huge Outlander fan, so what would be more perfect than a replica of the cowl Claire wore in the show? This beast was knit with two strands of Thick and Quick in “Barley” and size 50 needles. I used the Sassenach Cowl pattern, although a pattern wasn’t really needed. I changed the stitch count and the length to my liking. I think my friend is going to love it. It looks exactly like the original! I bought way too much yarn, so I might make one for myself. I have to admit, it’s pretty darn stylish! My project pages are linked below. Categories: Knit | Tags: cowl, handmade, knit, knitting, outlander | Permalink. 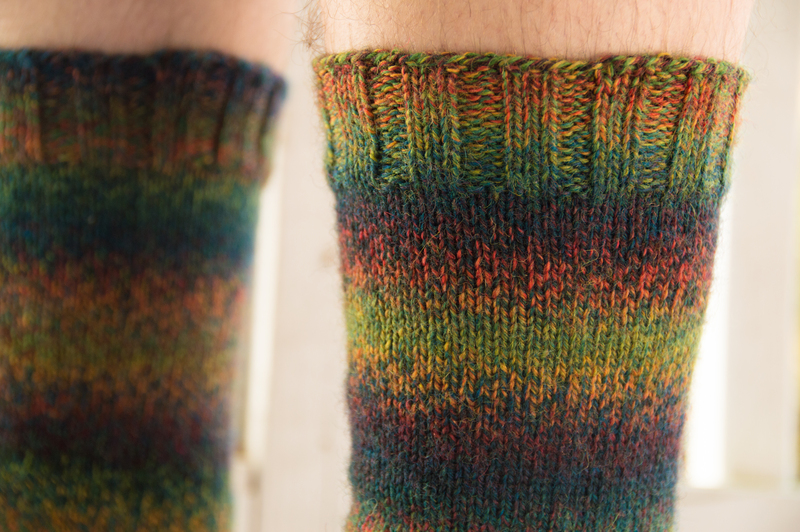 It took me way too long, but I finally got around to photographing these awesome socks I knit for my husband. 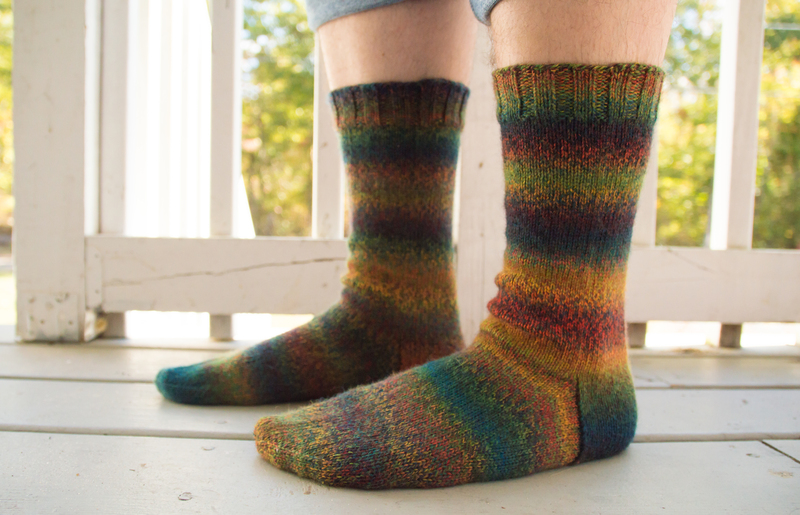 I had been after this particular colorway (Clover Colors) of Patons Kroy Socks 4 Ply for years. Every time I came across it in the store, there were never enough matching skeins to make a pair of socks. It was Joann’s that finally came through for me. I was in the store buying fabric and thought I’d check out the yarn. Lo and behold, they had three matching skeins! Score! I used the Gentleman’s Plain Winter Sock with Dutch Heel pattern from Knitting Vintage Socks, except I didn’t use a Dutch heel. I’ve knit the pattern before and didn’t care for that particular heel, so I substituted a French heel instead. I kept a record of all of my mods on my project page for those who might be interested. Truth be told, I may end up wearing these over regular socks when it starts to get colder. They are so pretty, I don’t think I could resist a turn wearing them! Categories: Knit | Tags: handmade, knit, knitting, socks, wool | Permalink. I took a risk and branched out from that peasant dress pattern I’ve been making over and over. I saw an adorable dress on Instagram, and I just had to make it. I spent hours scouring the internet for the pattern, and I finally found it in Tikatuly‘s Etsy shop. (I thought I’d save you guys the aggravation of searching for it.) I love this pattern. I couldn’t recommend it more. It was simple enough for a beginner like me, but it looks much fancier than a beginner garment. I’ve made three of these so far with fabric in my stash destined for at least three more. 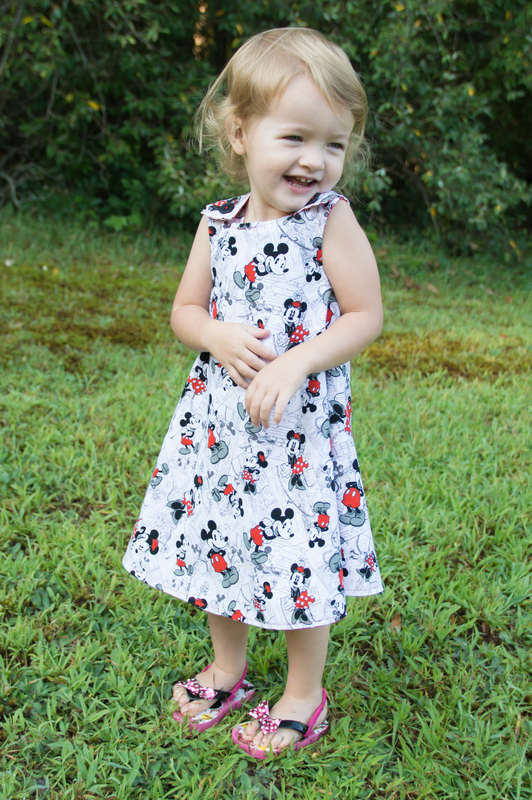 Up first is Kirsi’s “Minnie Mau” dress. 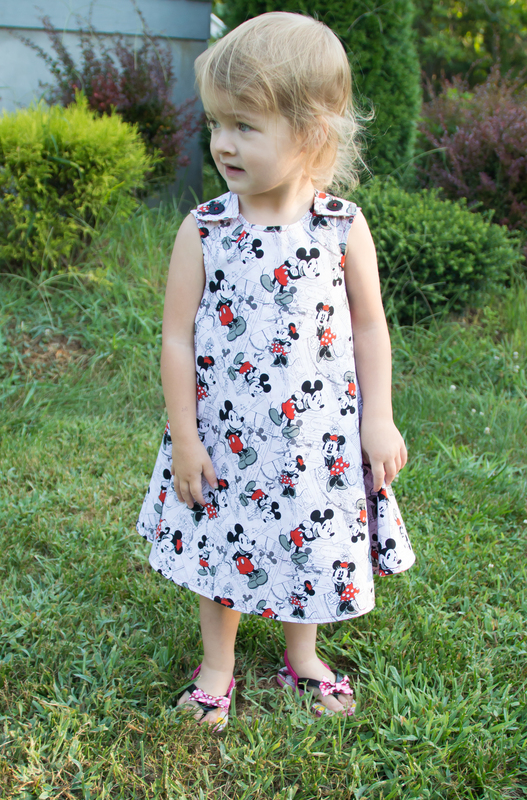 One side is a vintage Mickey and Minnie print, and the other side is a white polka dot print on a red background. Kirsi loves Minnie Mouse, so she was very, very excited to wear her dress. Score one for Mom! Kirsi lost interest in posing after the first couple of minutes, so I didn’t get any shots of the other side of the dress. 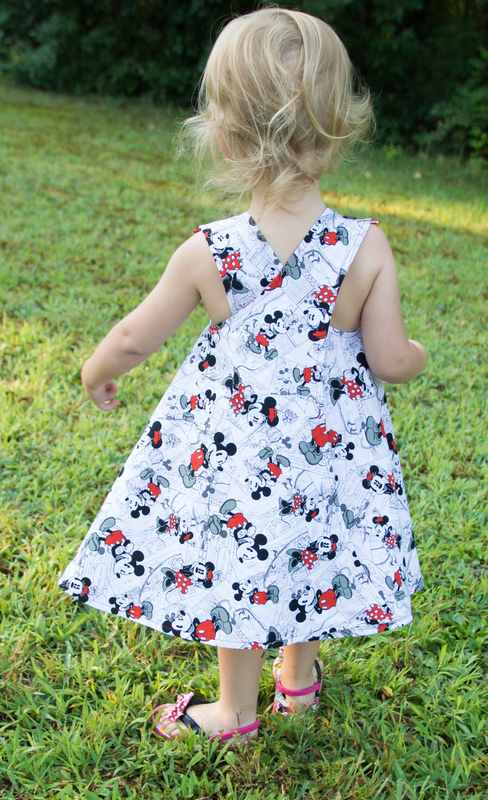 She’ll probably wear it Minnie Mouse side out 99% of the time, but I like having the option to turn the dress around if she were to soil the outside of it while we’re out. 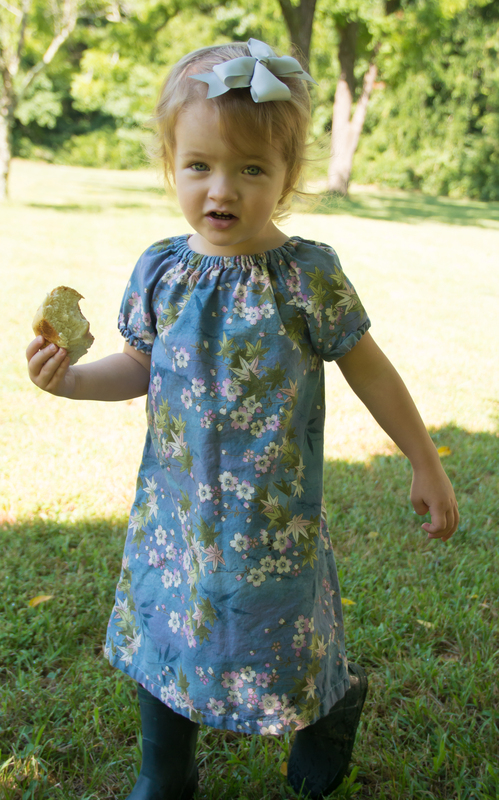 I was planning to make Eva a dress, too, but I discovered that the fabric I purchased for her dress wasn’t wide enough. I compromised and made her a tunic instead. She modeled it for me before heading off to school yesterday. 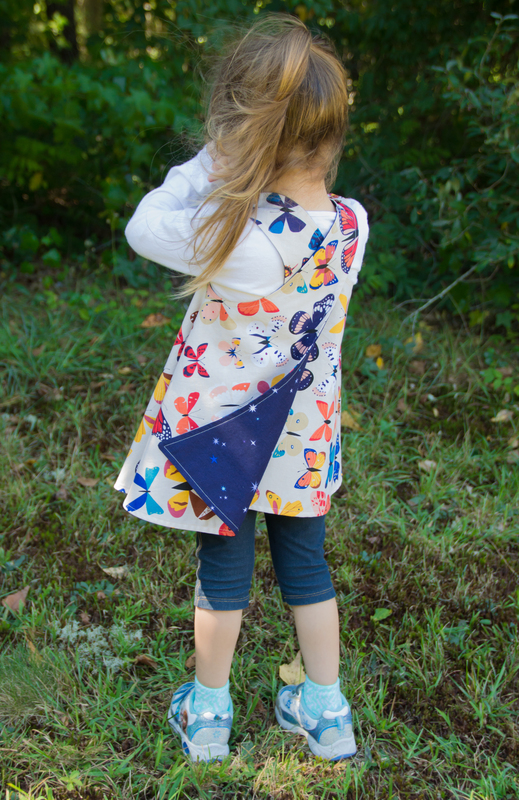 One side is a butterfly print, and the other side is a night sky print. I didn’t get shots of her wearing the other side, either, but you can see a bit of the night sky print in the last photo. 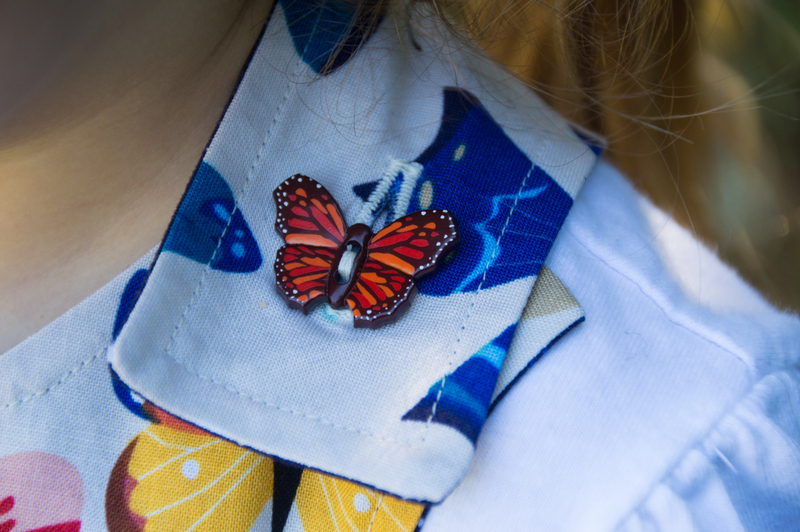 I totally bought special butterfly buttons for her top. Aren’t they awesome? I’m going to try to finish up a couple of knitting projects before sewing anything else. It’s about to get cold around here, and I want to have those handknits ready! 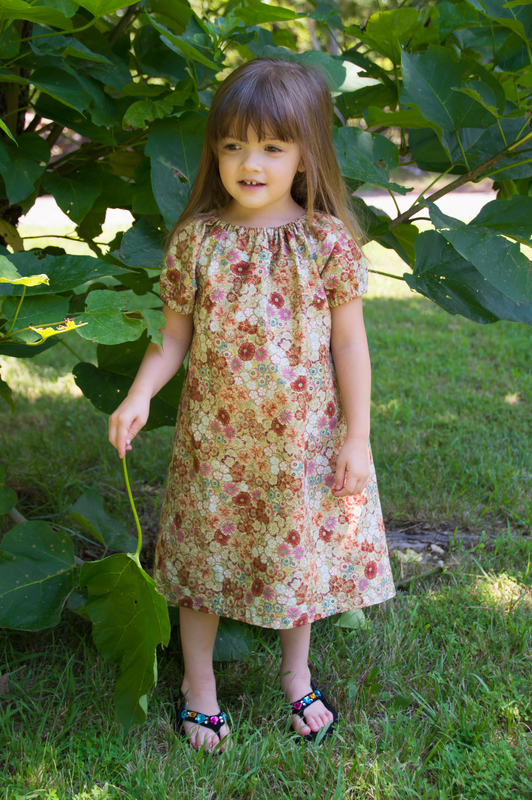 Categories: Sew | Tags: child, dress, handmade, sew, sewing, toddler, tunic | Permalink. 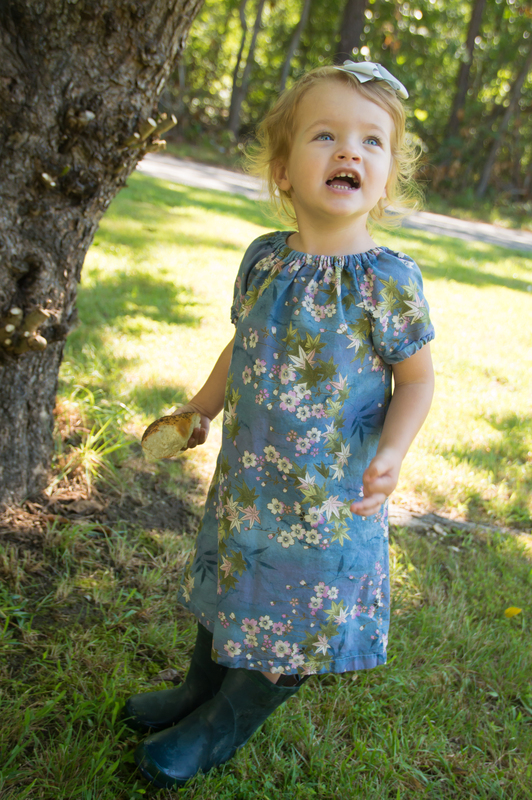 Here’s the second installment of the peasant dress! Kirsi is modeling her size 3T dress with a bow I made a while back. Isn’t she adorable?! She styled the ensemble with a pair of rain boots and a bagel. She was firm on these details and wouldn’t compromise on either. The day after I finished this dress, Kirsi put it on and refused to take it off for over 24 hours. She wore it all day, to bed, and all of the next morning. I had to remove it by force so I could bathe her. I love when my handmade stuff is appreciated! I’m going to make a couple shirts from the same pattern, then maybe I’ll move on to something a little more advanced. I’d love to learn how to do buttonholes and set in sleeves, and I’ve got a couple of tutus queued up to try as well. I don’t want to admit how many patterns I’ve bought for future projects. I’m telling ya, craft stuff multiplies! 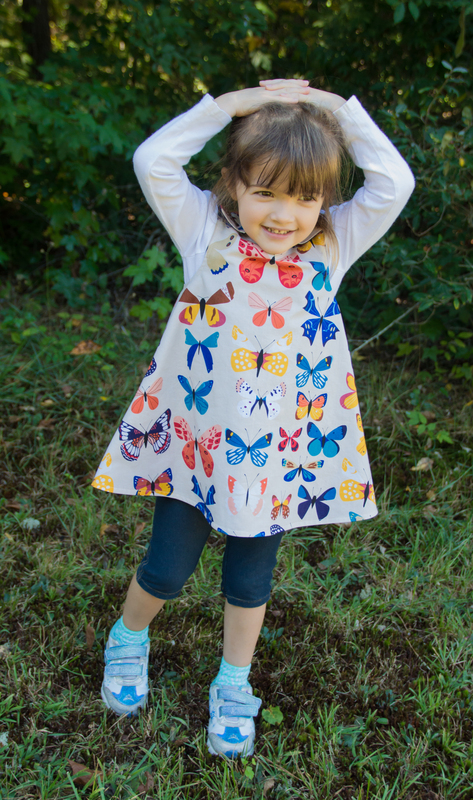 Categories: Sew | Tags: child, dress, handmade, sew, sewing, toddler | Permalink. We’ll, I’ve done it. I’ve picked up a new hobby. Shame on me. 😛 The good news is I don’t have a huge stash to go along with it. The bad news is I will probably accumulate one in the near future. I’ve discovered that like yarn, I prefer the pricier fabrics. The gaudier, the better, and if it has a touch of metallic, I’m sold. 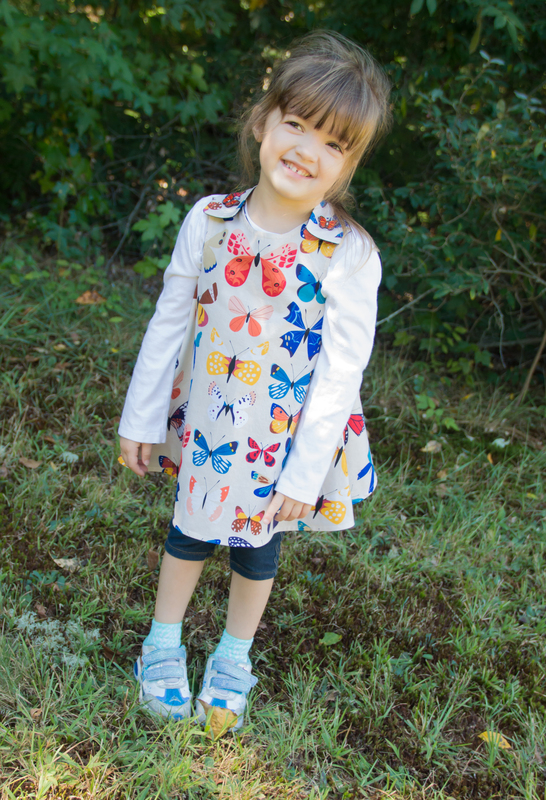 Categories: Sew | Tags: child, dress, handmade, sew, sewing | Permalink. 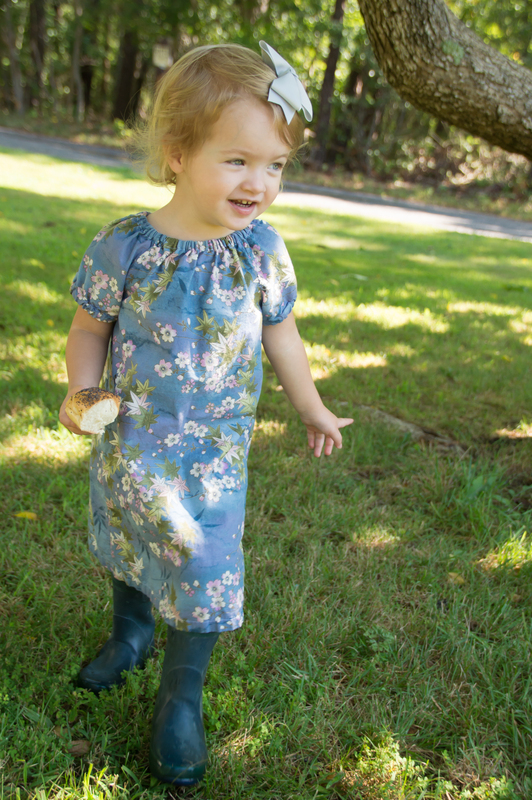 Another Chantilly Lace Sundress down! 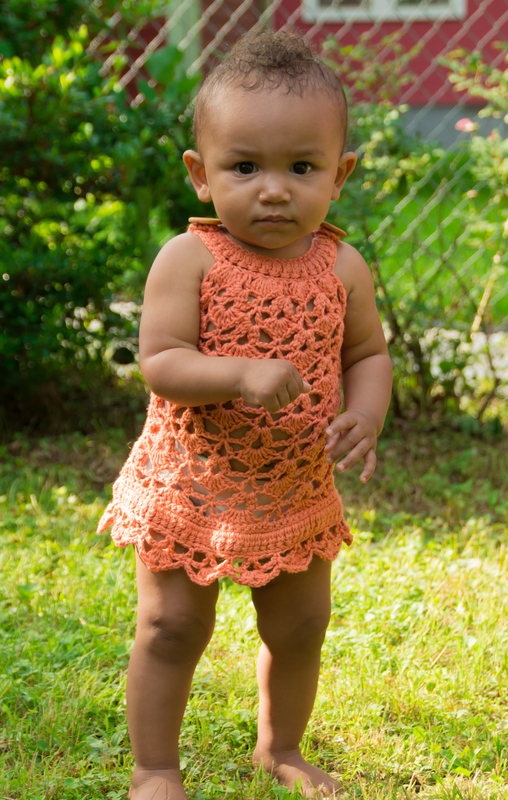 I whipped up a 6-12 month size for my cousin’s 10 month old daughter, Amenze. I don’t have anything too exciting (besides pictures) to report. I followed the pattern exactly except for using a bigger (H) hook. I like that this size isn’t very long. It’s great for babies who are crawling or have just started walking. I used Knit Picks CotLin in “Conch” – less than two balls! I think the color really compliments Amenze’s complexion. Also, the yarn came from stash. Hooray for me! 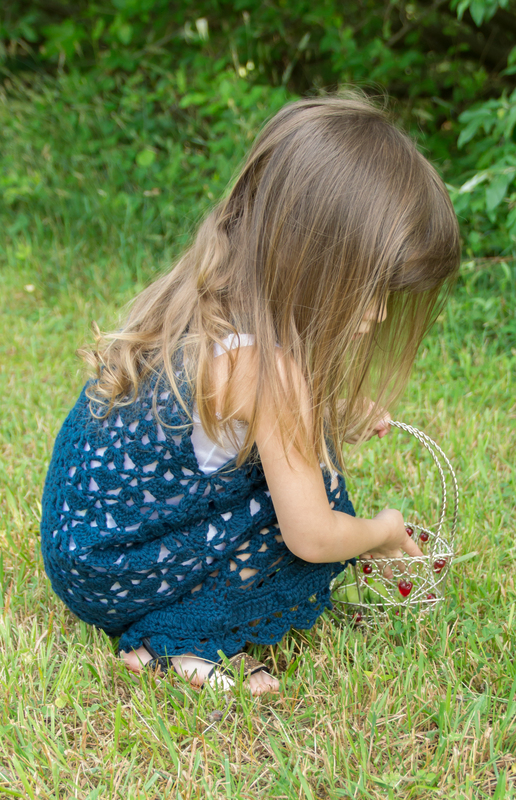 I have one more little dress to make, for Kirsi, in dark pink, but I’ve taken a break to knit a sweater for Ronan. I felt like his knitting needs were being ignored. 😛 There are just so many cute girly patterns that I can’t stop making stuff for my little ladies! 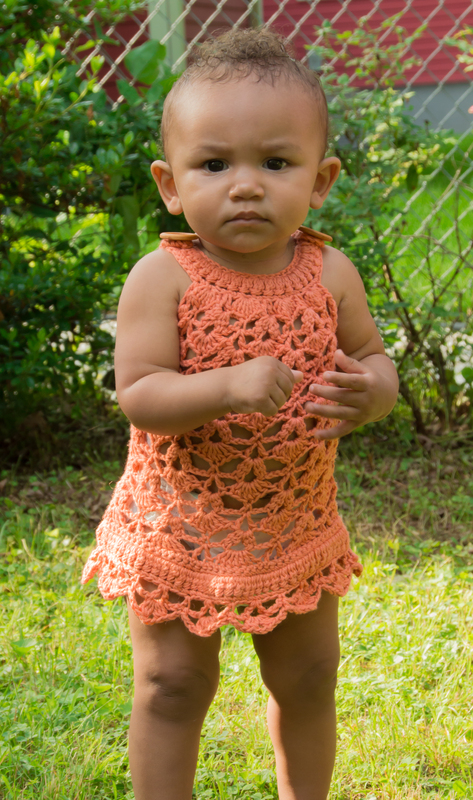 Categories: Crochet | Tags: baby, cotton, crochet, crocheting, dress, handcrafted, handmade, knitpicks, lace, linen, orange, peach, sundress | Permalink. 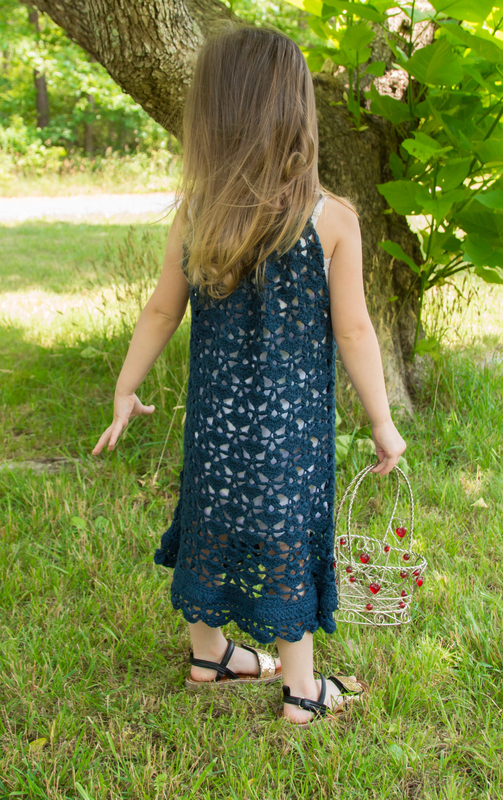 I received the Chantilly Lace Sundress pattern from my friend, Sara, not too long ago. I’ve been working on this dress sporadically for the past week and a half. Let me tell you, this thing is quick. 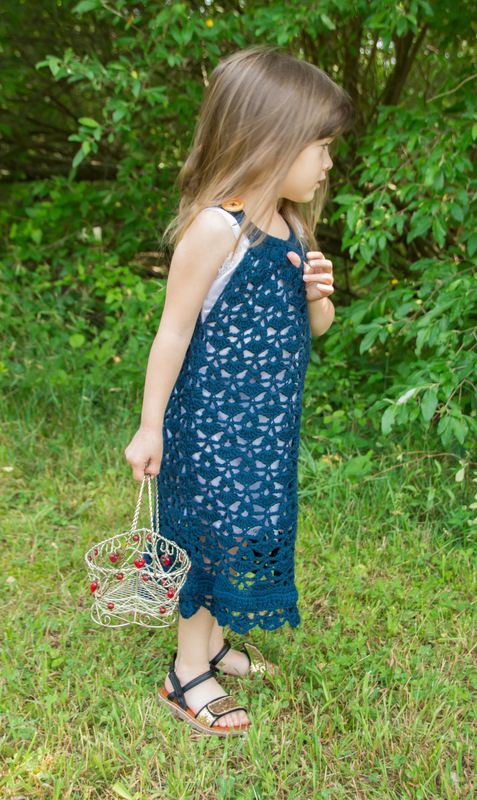 I added a couple of repeats to lengthen the dress, and it was still a super speedy project. 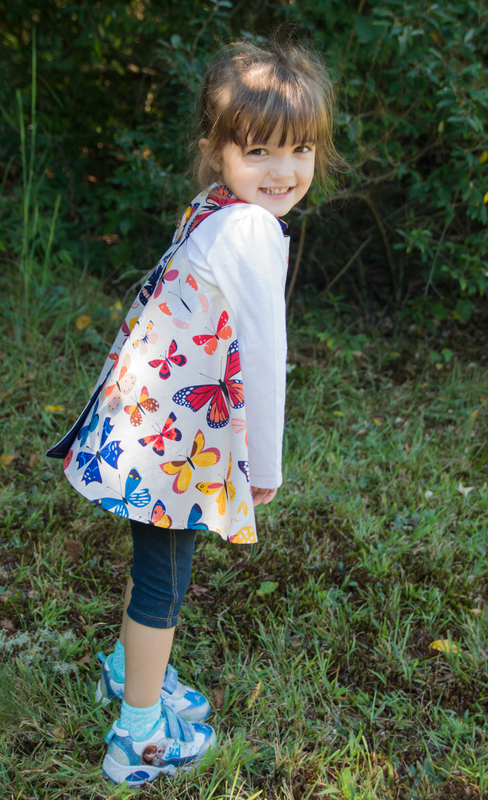 In these pictures, Eva’s modeling the size 4-5 years, but as I stated before, I added two repeats to the length. I think a dress made to the original length would be super cute paired with a pair of white leggings. I used Knit Picks Cotlin in “Planetarium” and a size H (5mm) crochet hook. 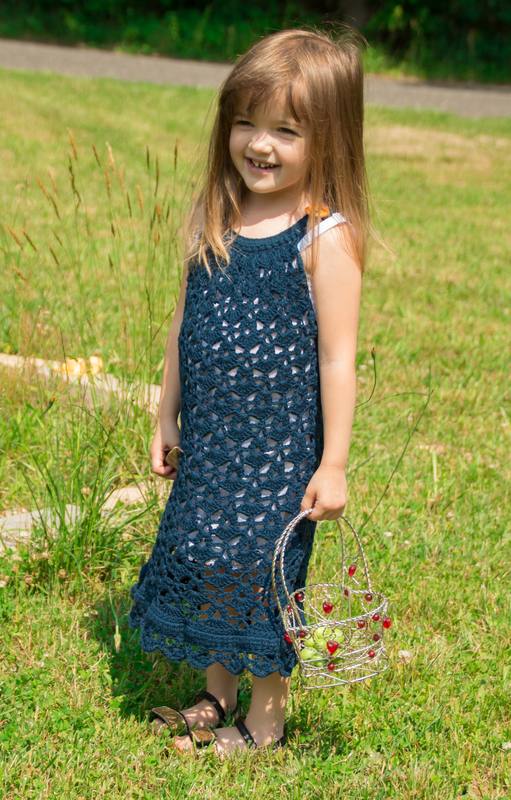 This dress, with my modifications, took a little over 500 yards of yarn to crochet. I bought a little slip for Eva to wear underneath the dress since it’s a little revealing as-is. Eva gushed over how pretty she looked, then told me I need to make one for Kirsi. In pink. Because Anna from Frozen wears pink. Good thing I ordered some dark pink Cotlin, I guess! 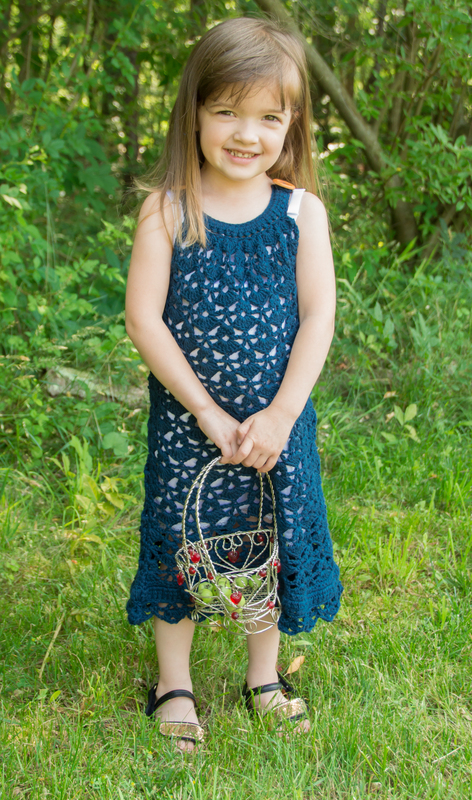 Categories: Crochet | Tags: blue, child, cotton, crochet, crocheting, dress, handmade, knitpicks, lace, linen, sundress | Permalink.